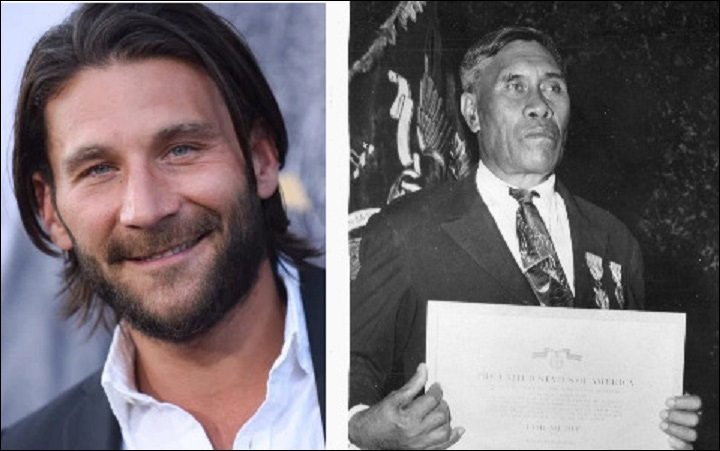 According to Deadline, Zach McGowan will star in the historical film Ni'ihau, directed by Gabriel Robertson and set in Hawaii during World War II. He will portray Benehakaka Kanahele, a native Hawaiian who received the Medal for Merit and Purple Heart for his part in killing the pilot of a downed Imperial Japanese plane in the aftermath of the attack on Pearl Harbor. You'll probably notice that Zach McGowan doesn't bear much of a resemblance to Kanahele, and it's even more of a stretch than casting Emma Stone as part Hawaiian in Aloha. Once again, members of the API community will watch as they are portrayed in media by white replacements. At this point, we are frustrated, but hardly surprised when this happens. Pacific Islanders have been abused throughout the U.S.'s history, and this appears to be just another manifestation of that shameful legacy. To our surprise, however, this may not even be the worst of it. What is disturbing here is the historical denialism bubbling up from under the surface. The Ni'ihau Incident led to President Franklin D Roosevelt issuing Executive Order 9066, which directly led to the mass internment of 119,803 Japanese-American men, women and children until the end of the war. The film is about the incident itself, which was seen to be the catalyst of fear that spurred Roosevelt's decree. In 1976, President Gerald Ford rescinded Executive Order 9066. First, I want to emphasize that this is not a personal attack on the author. We have to look critically at all statements about our history if we want to avoid repeating the mistakes of our past. The Ni'ihau Incident merits discussion, but it cannot be seen as the "catalyst" that led to the unjust incarceration of 120,000 Japanese Americans. Here is the problem with the above statement. Yes, the Ni'ihau Incident occurred, where a Japanese immigrant provided assistance to a downed pilot for the Imperial Japanese air force. However, the above quotation is inherently discounting the decades and decades of anti-Asian racism and institutionalized discrimination that influenced FDR, the state governors, congress, and local governments to create and implement Executive Order 9066 and its subsequent legal enforcement mechanisms. Remember that in 1922 Takao Ozawa v. United States, the Supreme Court used racial pseudoscience to decide that white meant Caucasian (in reality Western European), and thus Ozawa could be barred from naturalized citizenship, since the Naturalization Act of 1870 limited this to whites, as well as "aliens of African nativity and to persons of African descent." Numerous hate groups sprung up along the West Coast that tried to demonize all people of Japanese descent. 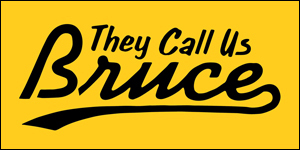 The Southern California Committee of One Thousand infamously said, "They exist like the yellowed butts in an over-full ashtray, vilifying the air with their loathsome smells..."
This is all compounded by the blatant racial bias that infected military and political leadership. General DeWitt, who was in charge of the Western Defense Command, said that "the Japanese are an enemy race," and that "a Jap's a Jap. It makes no difference whether the Jap is a citizen or not." Around this time, the Governor of Wyoming even threatened genocide in his state, saying that if people of Japanese descent were in his state unguarded during the war, there would be "Japs hanging from every pine tree." 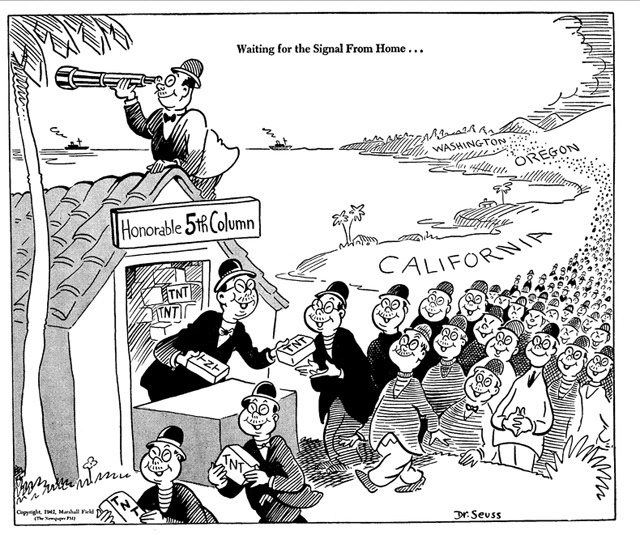 If you want to realize how normalized anti-Japanese discrimination was at the time, look at this cartoon that came out around that time, and note the artist's name in the corner. Note the artist's name in the corner. No Japanese Americans were ever convicted of espionage during WWII, and all rumors of a “5th Column” were thoroughly debunked. Yes, the Ni'ihau Incident is a part of history, and should not be dismissed or suppressed for any reason. However, historians for the military, academics, the government and others have all concluded that this incident was in no way the catalyst that led to Executive Order 9066. Personal Justice Denied, the Commission on Wartime Relocation and Internment of Civilians (CWRIC)'s 467-page report on Japanese American incarceration, concluded that EO9066 and the subsequent unjust imprisonment of around 120,000 citizens and their families were the result of "race prejudice, war hysteria, and a failure of political leadership." We have to remember that it was the widespread normalization of racial prejudice that made our society so willing to accept such a gross violation of the civil liberties of its citizens and their families. 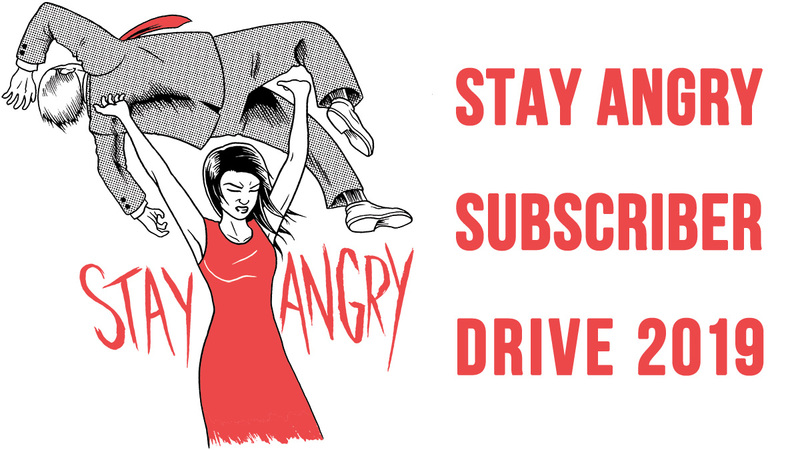 The article might have just been written poorly, and it is not clear whether or not this is a definite statement about the film's content and angle, but what is clear is that Asian Americans must take control of our history, and make sure that it is not exploited or abused, whether it is simply for a profit (although signs show that whitewashing isn't even that profitable at this point), or to push a more dangerous political agenda that uses immigrants as scapegoats.